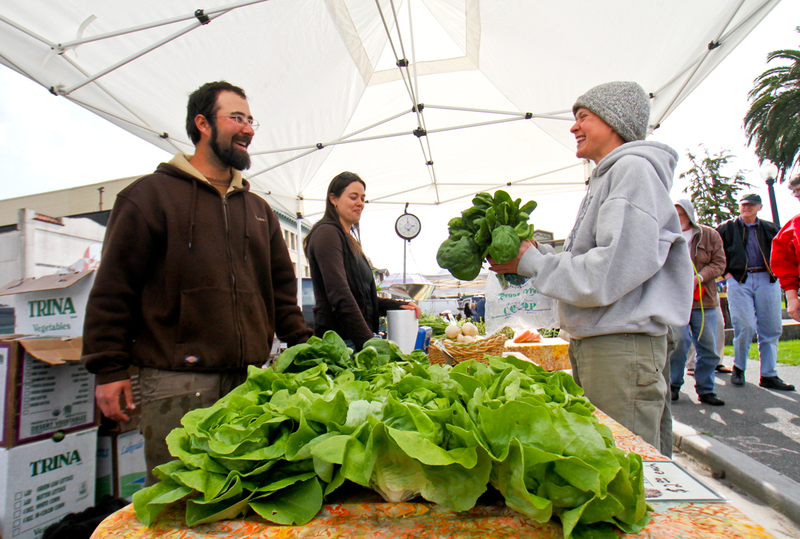 ARCATA – For those seeking fresh, local produce, purchasing at farmers’ markets is one way to connect with the farmers who grow the food. Community Supported Agriculture (CSA) programs at local farms take the process a step further. Three CSA farms available to Arcata-area residents are DeepSeeded Community Farm, Redwood Roots Farm, and the Arcata Educational Farm. Eddie Tanner has been farming in this area for a dozen years, but a year and a half ago he made the leap and began his own farm on nine and one-half leased acres at the west end of Stewart Avenue in Arcata. “Because we’re such a new farm, we’re always developing, always growing,” Tanner said. One of this winter’s new projects was establishing about three quarters of an acre of fruit trees, mostly apples with some pears and plums, as well as raspberries and blueberries. Although Tanner does sell produce at the Farmers’ Market and to some restaurants as well, DeepSeeded is primarily a Community Supported Agriculture farm. “Most of the produce that we grow is distributed right on site through seasonal memberships,” said Tanner. The six-month season starts in late May and runs into November. A separate six-week winter harvest begins just before Thanksgiving. “We harvest on Tuesdays and Fridays so members choose one of those two days to come pick up their produce. Produce is available all afternoon from 2:30 p.m. to 6:30 p.m. and then rolling over into the next morning if you’re unable to make that afternoon pick-up time,” Tanner said. Tanner will offer 160 shares this year. “I still have spots available now but I expect that they’ll be full by the end of April,” he said. Tanner can accommodate eight people for each of two sessions. The first session is full, but spaces are available for the second one starting in mid-July. Tanner also teaches classes and community workshops. He’s currently teaching a gardening class through Humboldt State’s Extended Education program and recently spoke at the Plan It Green conference.“I’ve always enjoyed teaching so that’s something I do pretty regularly,” he said. Additionally, he’s the author of The Humboldt Kitchen Gardener, a guide to growing fruits and vegetables organically in our bioregion. “My goal was to make a book that you could read in an afternoon and feel better equipped to go out and succeed in your garden,” said Tanner. For more information about CSA shares or internships at DeepSeeded Community Farm, visit arcatacsa.com, call (707) 825-8033 or e-mail deepseeded@gmail.com. Next week: Redwood Roots Farm and the Arcata Educational Farm. This entry was posted on Tuesday, April 27th, 2010 at 9:57 am	and is filed under News, Community. You can follow any responses to this entry through the RSS 2.0 feed.